Preliminary research revealed a hybrid activity of sorts, a centaur of the outdoor world, a multi-sport that is often enjoyed with a big scoop of type two fun. My husband Adam and I have become connoisseurs of this particular type of enjoyment and with a willingness to try about anything once, we committed to our first trip without expectation. The basic principles dovetailed with our previous experience of multi-day trips into the backcountry on foot or ski. Planning involved maps, pack lists, meal planning, travel routes and Google earth — all familiar to us. The cycling part was completely foreign, but luckily Ben has biked at an intimidating pace for the last half dozen years and had us covered. A two week adventure that requires strapping 60+ pounds of gear to a 90’s tandem bicycle (oh yeah, forgot to mention that detail) and longish 1000 meter daily climbs called for mental and physical preparation. Training consisted of going for daily spins around town on Betsy, our lovingly nicknamed bike built for two. Time in the saddle, no matter how minuscule, proved to equal less pain on lengthy rides. Fast forward three months, we made it to the islands and had our sights set on a remote beach accessible only by logging roads. Packing the bikes felt similar to practicing cursive with a non-dominate hand. We'd never tried to gracefully attach a pot, camera equipment and crab net to a bike frame before. Slightly different than shoving everything in a backpack and hitting the trail. Drastically contrasting to our townie training cruises. Regardless, the anticipation buzzed through our bodies. After cups of coffee and multiple rounds of gear Tetris, we pushed off. Although a little wobbly at first, eventually the movement came naturally. One foot in front of the other, Adam and I matched our strokes and began to relax into a rhythm. Our surroundings enveloped us, instilling an awakening effect and quickly sharpening our senses. We began to notice subtle shifts in wind, creaks and squawks of the old growth forests, and the musty smell of earth combined with robust floral perfumes. After a few rolling hills, the climbing intensified and our legs begged for reprieve. Balancing a heavily loaded bike proved to be challenging and our initial enthusiasm wavered slightly. In theory, a snack break before taking on the next climb sounded glorious. However, we were met with relentless mosquitos and gargantuan horseflies, hungrily nipping at unexposed flesh and forcing us to keep moving. 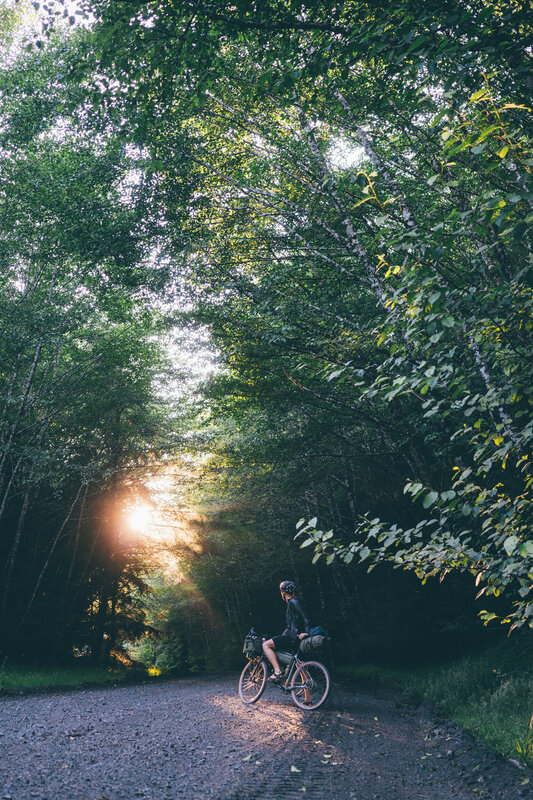 The steep incline of the island's logging roads forced us to slow, to move at a pace our bodies could manage, even dismounting to push intermittently. Our cadence seemed to match the magnetically carefree pace of the island. Haida Gwaii was a place where small talk routinely stretched to hours and it wasn’t outside the ordinary for travelers who visited for a few weeks to stay a lifetime. As we reached the high point of the ride, we began to relax into a manageable pace along a forested plateau, with views of the shimmering ocean in the distance. The challenge of the climb was overcome by moderating our speed, an analogy applicable to life that was not lost on us. It had taken us 16 hours by car to drive the coastal town of Prince Rupert, followed by a overnight ferry to Skidigate, BC — a journey in itself. It seemed the lengthy travel only contributed to our ability to sink into this unique landscape, like stepping into the knee-deep moss that carpeted the forest floor. The remote island chain of about 5,000 residents, is unlike any other destination in Canada — maybe even the world. The sacred islands hold a rich cultural history dating back more than 13,000 years, with Indigenous peoples holding an ironclad connection to the land, sea and sky. Totem poles at ancient Haida sites stretch skyward, holding nobly alongside red cedars and Sitka spruce. You can almost feel the pulse of the natural world in every ebb and flow of the tide, folding wings of a soaring eagle or curious gaze of a lone black bear. Living on an isolated island with limited services demands a gradual pace for residents and travelers alike. We adapted quickly to the simplicity, poking along through the villages and towns along our campaign, basking in the opportunity to chat with the locals about their unique lives. Arriving to our intended destination proved to be well worth the sweat, the uphill pushing, the downhill pulling and the days in the saddle. 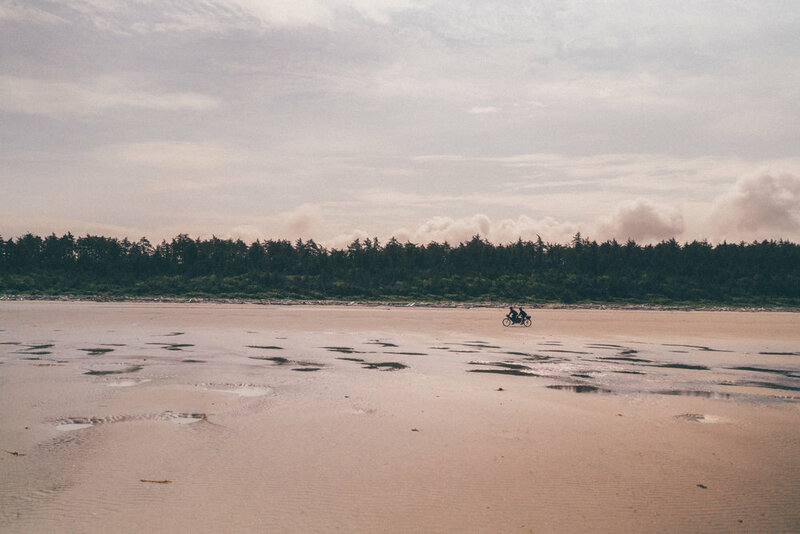 We arrived at sunset, impulsively letting out a boisterous howl, the sprawling sandy beach laid before us. Infinitely wild and formed by coastal erosion and glaciers, the bay provided a perfectly protected nook from the aggressive Pacific swells and high winds. Realizing that we had the beach to ourselves, we scoured the landscape carefully for a prized campsite for the next three nights. Setting up camp when bikepacking is a snap. The only provisions packed are essential, thus reducing camp clutter and increasing the utility of every item. Even Ben’s bike proved to be a sturdy tent tie-off. A few precious luxury items did make the cut; a small bluetooth speaker, carefully counted pour over coffee, a few camp towels and the coveted crab net. As we settled into camp the first night, smiles crept across our windswept faces. We stretched out amongst massive columns of driftwood, scattered along the beach as if they were a handful of toothpicks — a reminder of the ferocity of Haida Gwaii’s winter storms. We warmed our toes beside a crackling beach fire, reflecting on the wonders of the island. It became prevalent that bike travel had impacted how we experienced the environment around us. We were no longer observers encased in a windowed box, peering outside in awe. Rather, we were transformed to curious participants in a natural world. Each inhale of oceanic air cleansed our minds and bodies. As if by design, it bred what we didn't know we were searching for but desperately needed: minimalism, connection to our surroundings, and a deeper bond with each other over a shared sense of accomplishment. FRANKIE & ADAM FOSS are based out of beautiful British Columbia. They have produced digital media for brands in the outdoor industry, including YETI Coolers, Gore-Tex, and Sitka Gear. Together they run Foss Media and are extremely fortunate to collaborate with many talented photographers, filmmakers, writers, designers, editors, musicians and friends. 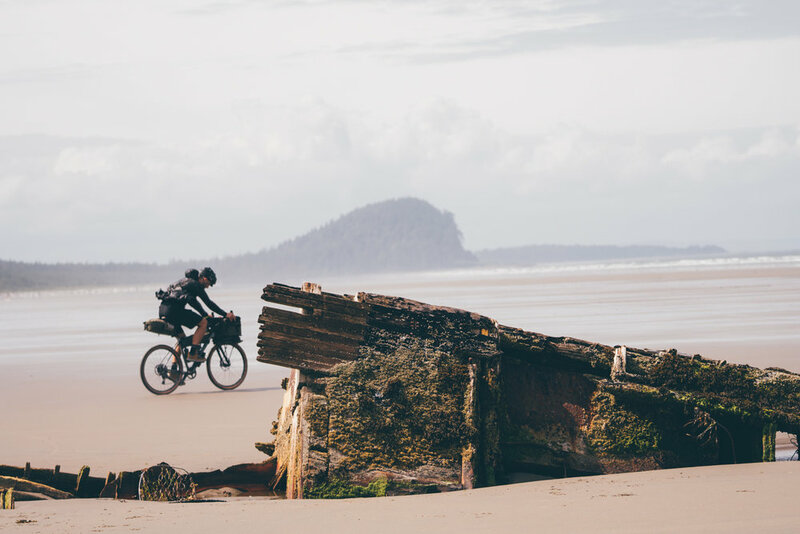 BEN JOHNSON is a Vancouver-based filmmaker, photographer and avid cyclist. 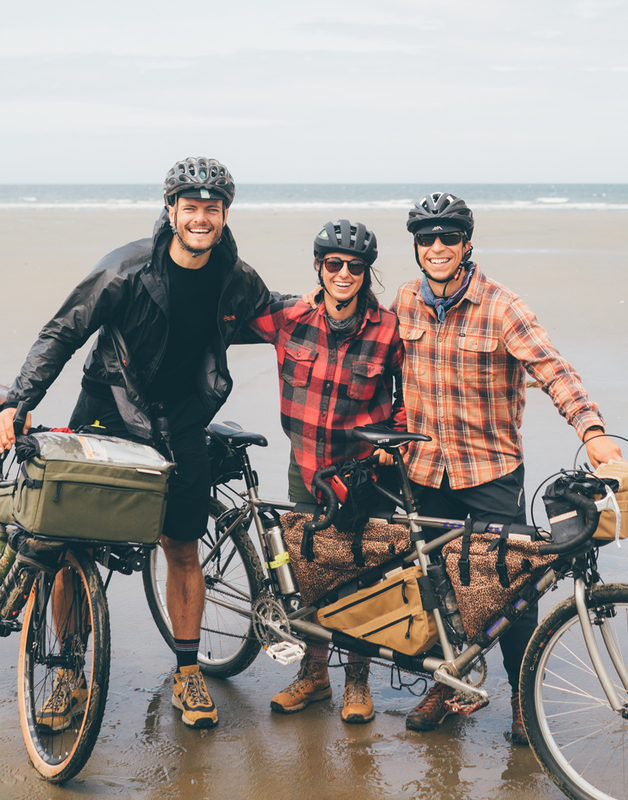 He has recently transitioned from the constraints of the tarmac to seek fatter tires and bigger adventure or in other words partake in the mythical activity known as bike packing. Most recently, he pedaled for ten days of cross country, self filmed bike touring through Peru’s Andes Mountains.